Don't worry, it's not all that complicated. Here's a useful guide on both strategies so that you can make the most of your garden space. Growing from seeds allows for a much wider selection of plants. You can find (and mail order) all sorts of fun plants that you might not be able to get at your local nursery. Why just settle for a green leaf lettuce start when you can grow a fun heirloom oakleaf lettuce from a seed? Bonus: Seeds are usually less expensive than starts. Direct sowing is exactly what it sounds like — when you sow (plant!) a seed directly into the soil. This is usually done in tidy, organized rows at specific depths into the soil. Direct sowing means you're intentionally putting a seed in the perfect spot for it grow. It gives you (the gardener!) the most control, which is a very good thing when you're growing in a small space, but it also takes the most time. This is when you take a handful of seeds and sprinkle them over a designated area – sort of like salting meat. These seeds fall on the soil haphazardly and lack precision. 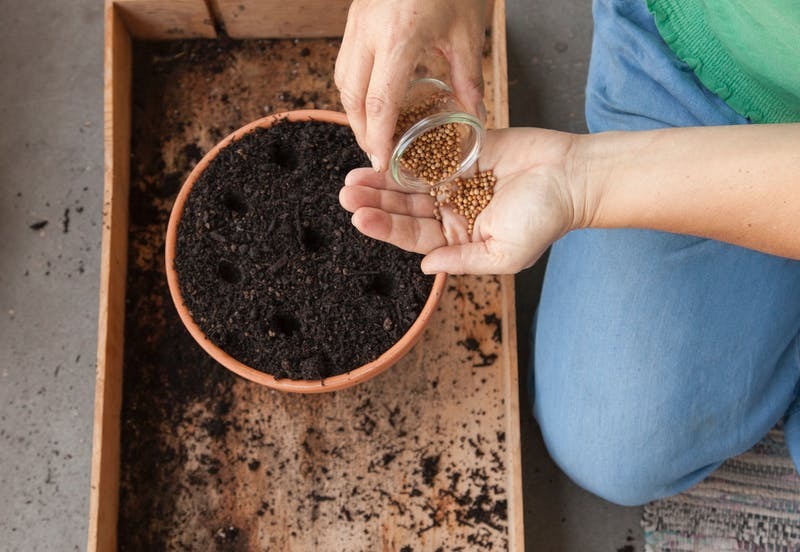 Many times you will "fork" these seeds in with a rake (or in the case of a small apartment, you can use an actual fork), although some seeds (like chamomile and thyme) are small enough that you can just leave them on top of the soil. Broadcast sowing is the best for stem-y plants that can grow close together without crowding like arugula, cilantro, and basil. All seed packets list planting information. While the packets are great guides, I've come to notice a pattern: The larger the seed, the deeper you plant it. Using this rule of thumb, plants tend to fall into three categories. Those that are planted 1/2-inch deep like leafy greens, brassicas, and alliums. Those that are planted 1-inch deep (think: fruits, melons, and legumes). I will admit that this is a wildly generalized statement, but trust me — it works. Rather than spend time reading every seed packet, I've adopted this lazy approach and have never had an issue. If you're more green than green-thumbed (read: you've never really gardened before), this is probably your best bet. You can find the basic plants at your local nursery and most of the work has already been done for you. Planting starts also speeds up the timeline between planting and harvesting. When transplanting a start into your garden, the only real rule is to provide enough space for the plant to grow. Start out by loosening the soil in your planter, so it's nice and airy. Then, loosen up the transplants and be sure to separate out individual plants — this will give them room to come to full maturity. If you bought a small pot of basil, for instance, it will probably contain more than a dozen small plants. Dig a deep-enough hole in the soil so that the entire root structure of the plant will fit. You don't want your roots all twisted up and pointing up out of the soil. What you're looking for is a nice loose root structure that faces down, so that the roots can start reaching out and growing strong. (You can even trim super-long roots by a few inches so that they're just two to three inches long.) It's really that simple.